Just a simple addon to allow players to move in to DLC vehicles. There are a number of other generic Arma addons or scripts that offer similar functionality but they were either outdated or inefficient. Please note, this DOES NOT remove the DLC purchase overlays; if you like the vehicles contained within the DLC and enjoy the content, please consider purchasing the DLC. 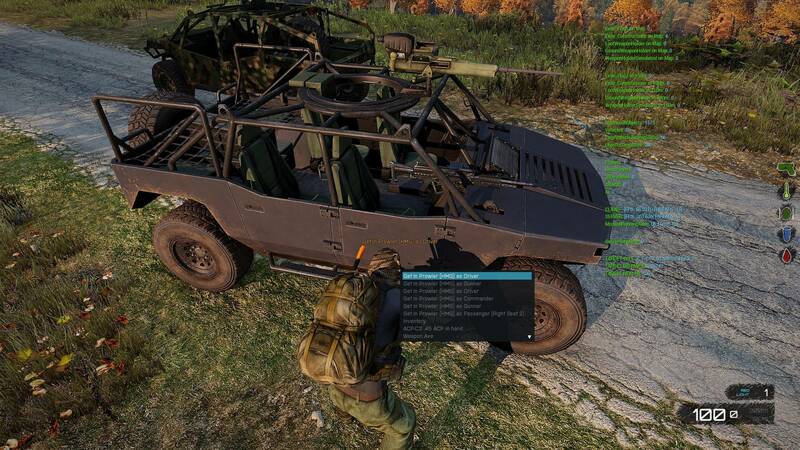 Native support for all DLC vehicles, including future DLC vehicles, without requiring script updates or changes. Native looking actions, including vehicle name and position description. Uses the native Exile interactions system to provide efficient actions on all DLC vehicles. The only positions not supported are those which use the Arma turret system as there is so much variation between positions from vehicle to vehicle (this includes Co-Pilot seats, and some "Commander" seats are actually turrets, as found in several Prowler variants). Merge your initPlayerLocal.sqf and Config.cpp files. Add the interaction actions to other vehicle types if required (Air, Ship, Tank..). Ensure file paths are correct for the required override and compiled files. Great work Kuplion, nice release. This will save all the complaints from noobs buying DLC vehicles that dont own APEX. If you did not pay for it and you use it anyway, you are a thief. Plain and simple. This type of script is termed legally as "Reverse Engineering" or "Circumventing Copyright Controls". It is a violation of civil and criminal codes under US law and EU law. As it allows you to bypass the mechanism in the code to use it when you should not be able to. An article covering this aspect in US law is HERE. US and EU copyright laws go 'hand in hand'. Typically what is illegal in one 'area' is illegal in the other. I understand that some may actually think such is OK, well, now you have been informed FROM BOHEMIA, that it is NOT OK.
You have an issue with this? CONTACT BOHEMIA, NOT ME! Their email address is in the posted email image. Thankfully no copyright was breached, eh? This script uses Arma 3 public scripting commands for all parts of it's functionality and I made certain to not remove any DLC overlays or prompts to purchase said DLC. In addition, I stated very clearly at the top of the original post that if you like the DLC vehicles to buy the DLC. The functionality of this script is in no way different to that of Exile or any other mod (Epoch..) that move a player into a vehicle upon purchase, thus performing an action which the player without the DLC would be unable to do from elsewhere in the game world. @Z80CPU Your argument is already answered by the email you posted from Bohemia's legal department. "We consider this script to be a grey area in our rules so for now we tolerate it". No mention of being a thief and you will burn in hell.